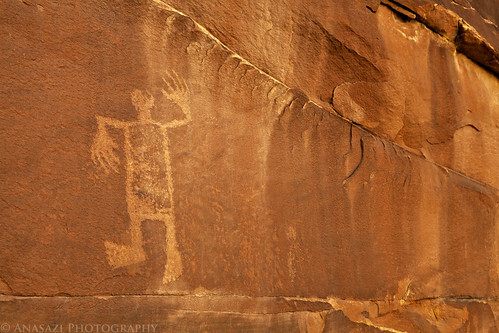 This anthropomorphic figure is to the left side of the main and larger set of petroglyphs known as the Wolfman Panel in Butler Wash. While this figure most likely doesn’t represent a ‘wolfman’ since large hands and feet are common in basketmaker petroglyphs, it certainly looks like one to me! This is a very interesting and easily accessible panel located near Bluff, Utah.